Crooked Lane Books, 9781629537771, 304pp. Joshua Speed, the enterprising second son of a wealthy plantation owner, has struck off on his own. But before long, he makes a surprising and crucial new acquaintance--a freshly minted lawyer by the name of Abraham Lincoln. When an orphaned girl from a neighboring town is found murdered and suspicion falls on her aunt, Speed makes it his mission to clear her good name. Of course, he'll need the legal expertise of his unusual new friend. Together, Lincoln and Speed fight to bring justice to their small town. But as more bodies are discovered and the investigation starts to come apart at the seams, there's one question on everyone's lips: does Lincoln have what it takes to crack his first murder case? 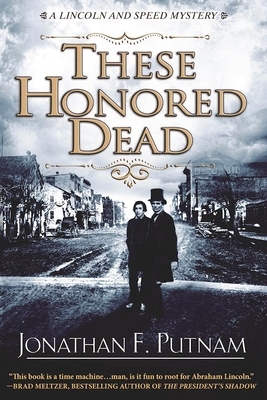 Inspired by actual events from the American frontier, Jonathan Putnam's thrilling debut These Honored Dead brings renewed verve and vigor to the historical mystery genre that readers haven't seen since Caleb Carr's The Alienist. Jonathan F. Putnam is a writer and attorney. A graduate of Harvard College and Harvard Law School, he is a nationally renowned trial lawyer and avid amateur Lincoln scholar. He currently lives with his family in London, England. This is his first novel.